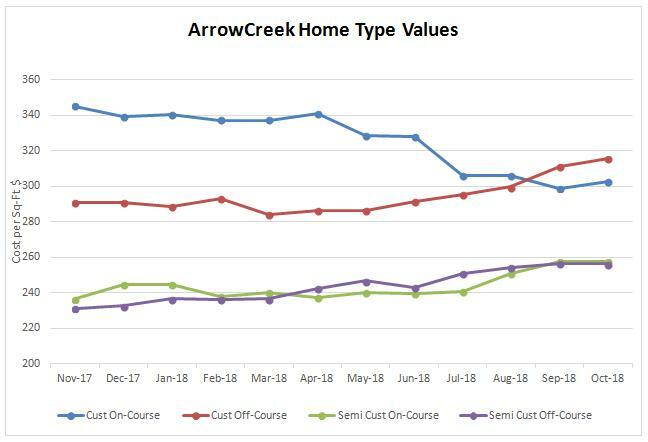 ArrowCreek411 | "ArrowCreek411 is all about all ArrowCreek"
Welcome to the ArrowCreek monthly property value update for our High Desert, Semi-Rural community that happens to contain a PRIVATE Golf Course. Participation in the private golf club is purely optional for all interested parties. The financial diversity within the ArrowCreek community was put in place by the designer of the community and the county in 1997. It consists of 506 semi-custom homes, typically for middle and upper-middle-income families and individuals, and 579 custom home sites, typically for upper middle and high net worth individuals, of which 428 custom homes have or are being built. As an observer can see, we are a very financially diverse community spanning a large area, roughly 25 square miles, below Mount Rose. This report contains the data that was available on 29 March from the Washoe County Assessor’s Records. The vagaries of the housing market have definitely caught up with the ArrowCreek community. In fact, the number of homes and properties sold/transferred directly impinging on the golf course has decreased over the past year to the point where only 15 homes have changed ownership. Five (5) properties changed owners during this reporting period. This continues a ‘poor’ winter selling season from November now through March. Custom homes on the Golf Course (Non-Residential area) now exhibit a -3.4% premium to Custom homes not on the course. 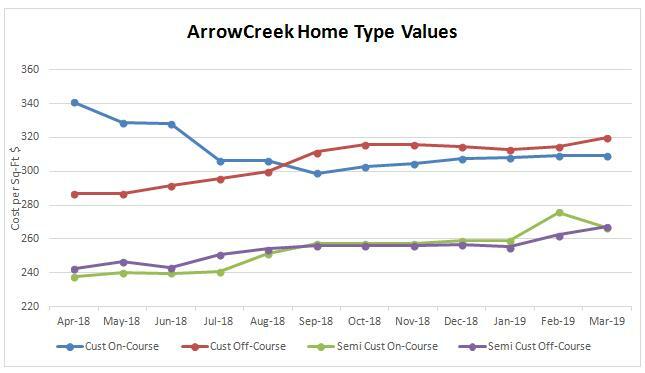 In the meantime, Semi-Custom homes not on the course are -0.2% lower than those abutting the course (But the statistics suggest this is an anomalous condition). This, of course, leads to the question of ‘What are the value propositions for ArrowCreek properties?’ Key ‘take-aways’ of these ‘facts’ are that smaller homes are selling better than larger homes and ArrowCreek owners have the option to join ‘The Club at ArrowCreek’ or not to join – an individual choice of freedom versus other gated communities. Furthermore, it appears that our ‘value proposition’ of being a secure, family oriented community, with excellent schools, is being recognized by the real estate community. Broader marketing should help the entire community with an emphasis on the use of the southeast connector and the construction of a new junior High School just outside our main entrance. 1. ArrowCreek properties have stayed in the premium class within Washoe and Douglas Counties. As you read this report, you will see that prices have been trending together since the winter of 2017-2018. 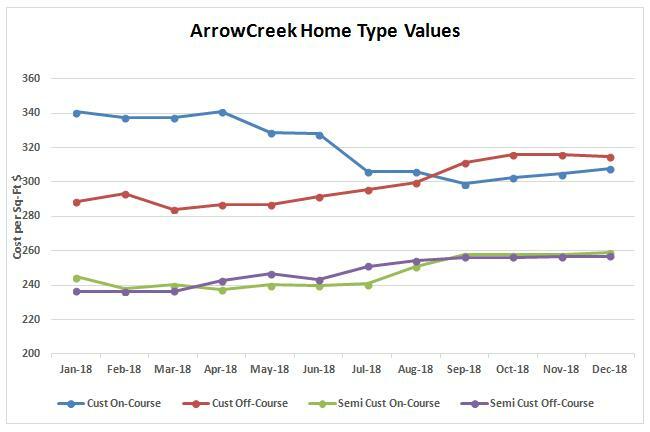 This trend indicates that homes in ArrowCreek appear to be settling into a growth pattern beginning in the $290 per square foot region. We have nineteen neighborhoods. With five properties in five neighborhoods changing hands this past month, there wasn’t a “hottest” neighborhood. a.) Five (5) properties were recorded sold in ArrowCreek between 15 February and 8 March 2019 (per the Washoe County Assessor, who appears to be current in closed sales). This brings the total number of properties transferred over the past rolling year to 97 or 8.9% turnover rate for our community. So, sales of ArrowCreek properties has declined by 4% over the past three months. The turn-over rate remains a relatively low, still in the single digits, that may be attributed to general satisfaction with living in our gated community and/or a positive perspective on our amenities with an emphasis on the secure stable environment offered within ArrowCreek. b.) One (1) property on the golf course (where the property boundaries actually touch the golf course, not just have a ‘view’ of it) was closed during this reporting period. The rolling average selling price for homes on the golf course now stands at $295.02 per square foot. This is a decrease of $4.61 per square foot from February’s value, based upon the statistical rolling average calculation. The 12-month rolling average sales price decreased to $1,177,733.33, again based upon statistical methods. The rolling average selling price for undeveloped property on the golf course still stands at $336,234.08 per acre. c.) Four (4) properties were sold that are not connected to the golf course. The rolling average selling price for off-course homes increased to $284.38 per square foot, which is up by $3.30 per square foot. The twelve-month rolling average sales price for non-golf course homes decreased to $996,248.05. The rolling 12-month average selling price for vacant land, not on the golf course, now stands 92% below vacant golf course property at $175,168.77 per acre. Reno market ‘in general’ – Custom homes in Reno are selling, on average, for $286.49 per-square-foot (Median price $1,215,000) with an average of 196 days, or 6.5 months, on the market. As noted above, you can see our ArrowCreek comparable Custom homes are selling $23-$33 per-square-foot higher. Data for separate ArrowCreek average time on market was not available. Reno homes comparable to ArrowCreek Semi-Custom homes are selling for $226.05 per square-foot (Median price $630,000) with a time-on-market of 119 days, or 4.0 months. Again, ArrowCreek Semi-Custom home averages are around $41 higher per-square-foot. Median prices rose across the Reno market by 16.0% during the comparable past year while ArrowCreek combined average prices were 6.2% higher. Sparks market ‘in general’ – The top quartile in the Sparks market actually compares with the Semi-Custom homes in ArrowCreek. The median price for these Sparks homes is $191.10 per-square-foot (Median price $579,995) with an average of 97 days on the market, or 3.2 months. ArrowCreek Semi-Custom home averages are around $76 higher per-square-foot. Median prices rose across this market by 8.4% during the comparable past year. For the ArrowCreek community, the Semi-Custom homes increased by 2.2%. 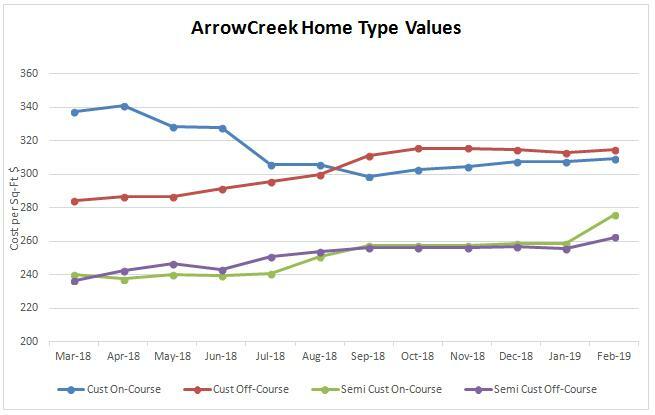 However, individually for an ArrowCreek Semi-Custom, not on the golf course, the increase over the past year was 11.5%. Some owners of ArrowCreek believe they reside in a ‘golf community.’ Those words appear to emanate from those who have chosen to belong to the ‘private’ golf club and participate in its many activities. In their minds, it may be true; however, in fact, the truth is only a third of the homes are on the golf course and less than 50% of owners are actually members of ‘the club.’ Yes, we have a private golf club within our gated community, but we also enjoy the freedom to belong or not. The ‘value proposition’ for our unique community should continue to focus on attracting professionals who value security, good schools and recreational opportunities. More people will come to the ArrowCreek ‘experience’ as Nevada businesses gather top talent with competitive salaries. 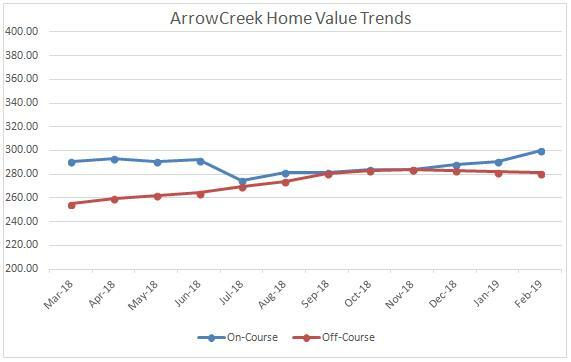 Welcome to the ArrowCreek monthly property value update for our High Desert, Semi-Rural community that happens to contain a PRIVATE Golf Course. Participation in the private golf club is purely optional for all interested parties. The financial diversity within the ArrowCreek community was put in place by the designer of the community and the county in 1997. It consists of 506 semi-custom homes, typically for middle and upper-middle-income families and individuals, and 579 custom home sites, typically for upper middle and high net worth individuals, of which 428 custom homes have or are being built. As an observer can see, we are a very financially diverse community spanning a large area below Mount Rose. This report contains the data that was available on 26 February from the Washoe County Assessor’s Records. The vagaries of the housing market have definitely caught up with the ArrowCreek community. In fact, the number of homes and properties sold/transferred directly impinging on the golf course has decreased over the past year to the point where there doesn’t exist a ‘statistical sample size. Thus, the statistics presented below for homes and properties on the golf course should be viewed with skepticism. Five (5) properties changed owners during this reporting period. This continues a ‘poor’ winter selling season from November through February. Custom homes on the Golf Course (Non-Residential area) now exhibit a -1.7% premium to custom homes not on the course. 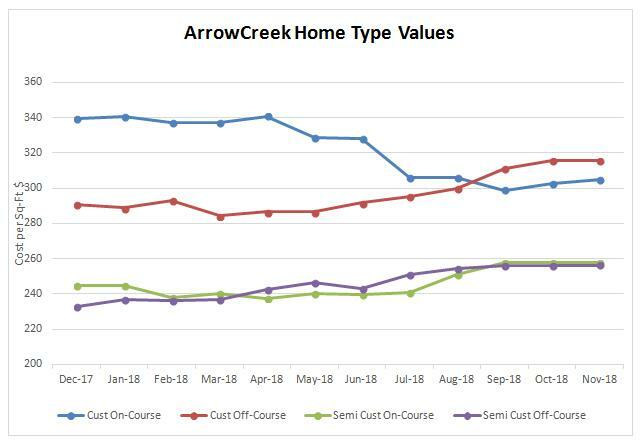 In the meantime, Semi-Custom homes not on the course are -4.8% lower than those abutting the course (But the statistics suggest this is an anomalous condition). This, of course, leads to the question of ‘What are the value propositions for ArrowCreek properties?’ Key ‘take-aways’ of these ‘facts’ are that smaller homes are selling better than larger homes and ArrowCreek owners have the option to join ‘The Club at ArrowCreek’ or not to join – an individual choice of freedom versus other gated communities. Furthermore, it appears that our ‘value proposition’ of being a secure, family oriented community, with excellent schools, is being recognized by the real estate community. Broader marketing should help the entire community with an emphasis on the use of the southeast connector. 1. ArrowCreek properties have stayed in the premium class within Washoe and Douglas Counties. As you read this report, you will see that prices have been trending together since last winter after a spike in property values for properties on the golf course in the spring of 2017 that continued thru spring of 2018. 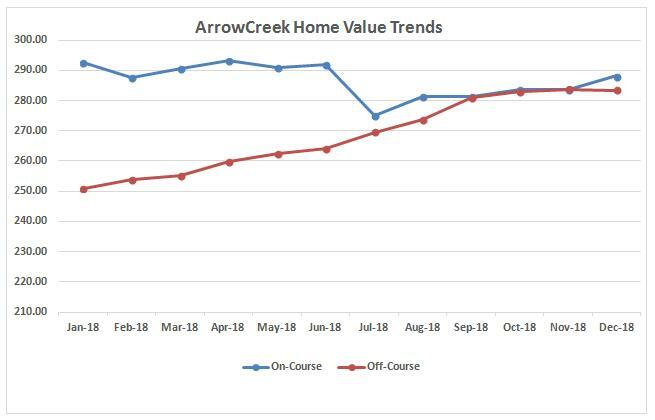 What this trend indicates is that homes in ArrowCreek appear to be settling into a growth pattern beginning in the $290 per square foot region. With five properties in four neighborhoods, we have nineteen neighborhoods, changing hands this past month, the “hottest” neighborhood was Granite Point I. a.) Five (5) properties were recorded sold in ArrowCreek between 24 January and 14 February 2019 (per the Washoe County Assessor, who appears to be current in closed sales). This brings the total number of properties transferred over the past rolling year to 100 or 9.2% turnover rate for our community. This remains a relatively low rate, still in the single digits, that may be attributed to a general satisfaction with living in our gated community and/or a positive perspective on our amenities and an emphasis on the secure stable environment offered within ArrowCreek. b.) One (1) property on the golf course (where the property boundaries actually touch the golf course, not just have a ‘view’ of it) was closed during this reporting period. The rolling average selling price for homes on the golf course now stands at $299.630.60 per square foot. This is an increase of $9.03 per square foot from January’s value, based upon the statistical rolling average calculation ONLY, as no homes were closed during the month. The 12-month rolling average sales price increased to $1,192,214.29, again based upon statistical methods. The rolling average selling price for undeveloped property on the golf course stands at $336,234.08 per acre. c.) Four (4) properties were sold that are not connected to the golf course. The rolling average selling price for off-course homes decreased to $281.08 per square foot, which is down by $0.96 per square foot. The twelve-month rolling average sales price for non-golf course homes decreased to $979,677.57. One of these properties was a lot for development. The rolling 12-month average selling price for vacant land, not on the golf course, now stands 92.5% below vacant golf course property at $174,656.19 per acre. Reno market ‘in general’ – Custom homes in Reno are selling, on average, for $289.22 per-square-foot (Median price $1,250,000) with an average of 203 days, 6.8 months, on the market. As noted above, you can see our ArrowCreek comparable Custom homes are selling $20-$25 per-square-foot higher. Data for separate ArrowCreek average time on market was not available. Reno homes comparable to ArrowCreek Semi-Custom homes are selling for $226.50 per square-foot (Median price $629,900) with a time-on-market of 113 days, 3.8 months. Again, ArrowCreek Semi-Custom home averages are around $50-$88 higher per-square-foot. Median prices rose across the Reno market by 11.2% during the comparable past year while ArrowCreek combined average prices were 7% higher. Sparks market ‘in general’ – The top quartile in the Sparks market actually compares with the Semi-Custom homes in ArrowCreek. The median price for these Sparks homes is $189.92 per-square-foot (Median price $550,000) with an average of 88 days on the market, approaching 3 months. ArrowCreek Semi-Custom home averages are around $82 higher per-square-foot. Median prices rose across this market by 6.6% during the comparable past year. For the ArrowCreek community, the Semi-Custom homes increased 12.9%. 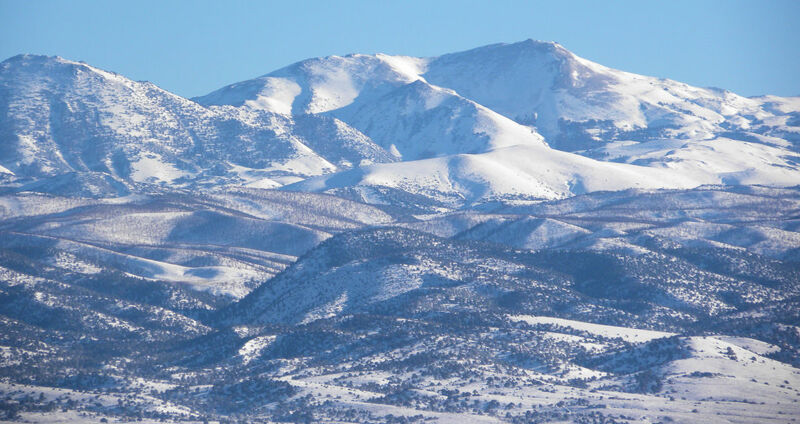 Here is a handy link for checking the snow levels at your favorite ski resort or mountain …..in the Reno-Tahoe area or for anywhere in the world! Have fun! Stay warm! Stay safe! HAPPY NEW YEAR! 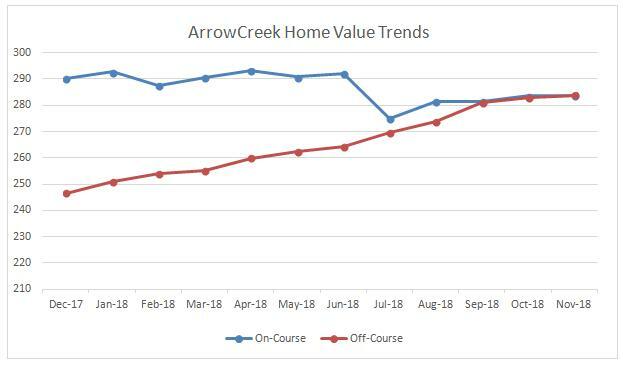 Welcome to the ArrowCreek monthly property value update for a High Desert, Semi-Rural community that happens to contain a PRIVATE Golf Course. Participation in the private golf club is purely optional for all interested parties. The financial diversity within the ArrowCreek community was put in place by the designer of the community and the county in 1997. It consists of 506 semi-custom homes, typically for middle and upper middle-income individuals, and 579 custom home sites, typically for upper middle and high net worth individuals, of which 428 custom homes have or are being built. As an observer can see, we are a very financially diverse community. This report contains the data that was available on 29 December from the Washoe County Assessor’s Records. The vagaries of the housing market have definitely caught up with the ArrowCreek community. Only two (2) properties changed owners during this reporting period. This is a significant drop from the previous months and year-ago levels where we had ten properties changing hands. Custom homes on the Golf Course (Non-Residential area) now exhibit a -2.4% premium to custom homes not on the course. In the meantime, Semi-Custom homes not on the course are -0.9% lower than those abutting the course. This, of course, leads to the question of ‘What are the value propositions for ArrowCreek properties?’ Key ‘take-aways’ of these ‘facts’ are that smaller homes are selling better than larger homes and ArrowCreek owners have the option to join ‘The Club at ArrowCreek’ or not to join – an individual choice of freedom versus other gated communities. Furthermore, it appears that our ‘value proposition’ of being secure, family oriented, and with excellent schools, is not being recognized by the real estate community. Broader marketing should help the entire community with an emphasis on the use of the southeast connector. 1. ArrowCreek properties have stayed in the premium class within Washoe and Douglas Counties. As you read this report, you will see that prices began to trend together after a spike in property values for properties on the golf course in the spring of 2017 that continued thru spring of 2018. 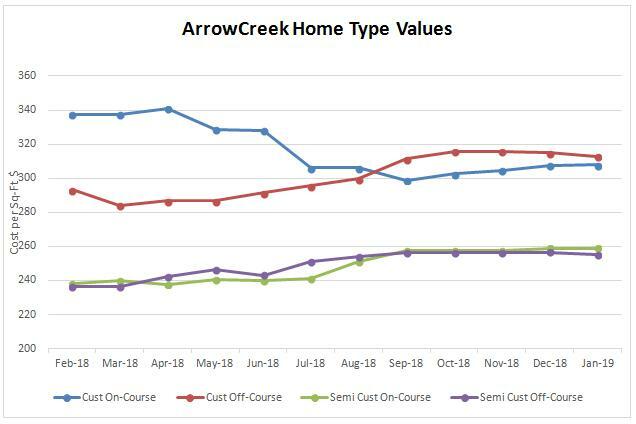 What this trend indicates is that homes in ArrowCreek appear to be settling into a growth pattern beginning in the $283 per square foot region. With only two properties in two neighborhoods changing hands this past month, there wasn’t a “hottest” neighborhood. a.) Only two (2) properties were recorded sold in ArrowCreek between 30 November and 12 December (per the Washoe County Assessor, who appears to be current in closed sales). This brings the total number of properties transferred over the past rolling year to 95 or 8.7% turnover rate for our community. This remains a relatively low rate, still in the single digits, that may be attributed to a general satisfaction with living in our gated community and/or a positive perspective on our amenities and an emphasis on the secure stable environment offered within ArrowCreek. b.) There weren’t any properties on the golf course (where the property boundaries actually touch the golf course, not just have a ‘view’ of it) were closed during this reporting period. The rolling average selling price for homes on the golf course now stands at $288.16 per square foot. This is an increase of $4.48 per square foot from November’s value, based upon the statistical rolling average calculation. The 12-month rolling average sales price decreased to $1,137,866.67, again based upon statistical methods. The rolling average selling price for undeveloped property on the golf course now stands at $305,412.13 per acre. c.) Two (2) properties were sold that are not connected to the golf course. The rolling average selling price for off-course homes decreased to $283.45 per square foot, which is down by $0.33 per square foot. The twelve-month rolling average sales price for non-golf course homes increased to $967,618.54. One of these properties was a lot for development. The rolling 12-month average selling price for vacant land, not on the golf course, stands 72% below vacant golf course property at $177,385.21 per acre. 2. Winter is here and the housing market is very soft. For those desiring a secure, safe environment to raise a family, ArrowCreek should not be over-looked. Reno market ‘in general’ – Custom homes in Reno are selling, on average, for $285.82 per-square-foot (Median price $1,175,000) with an average of 186 days on the market. As noted above, you can see our ArrowCreek comparable custom homes are selling $22- 29 per-square-foot higher. Data for separate ArrowCreek average time on market was not available. Reno homes comparable to ArrowCreek semi-custom homes are selling for $217.01 per square-foot (Median price $574,000) with a time-on-market of 99 days. Again, ArrowCreek Semi-Custom home averages are around $39 higher per-square-foot. Median prices rose across the Reno market by 6.2% during the comparable past year while ArrowCreek combined average prices were 11.3% higher. Sparks market ‘in general’ – The top quartile in the Sparks market actually compares with the Semi-Custom homes in ArrowCreek. The median price for these Sparks homes is $180.89 per-square-foot (Median price $549,000) with an average of 103 days on the market. ArrowCreek Semi-Custom home averages are around $78 higher per-square-foot. Median prices rose across this market by 9.4% during the comparable past year. For the ArrowCreek community, the Semi-Custom homes rose 7.0%. Let your opinion on Truckee Meadows growth be heard! Take this survey! It does not take much of your time and it shows you what directions the county planners are looking at for future growth of our Truckee Meadows! Once you have prioritized what is important to you, you can click between the proposed scenarios to see how each one fulfills your priorities and then rank the scenarios. At the end of the survey you can see the results of responses so far. 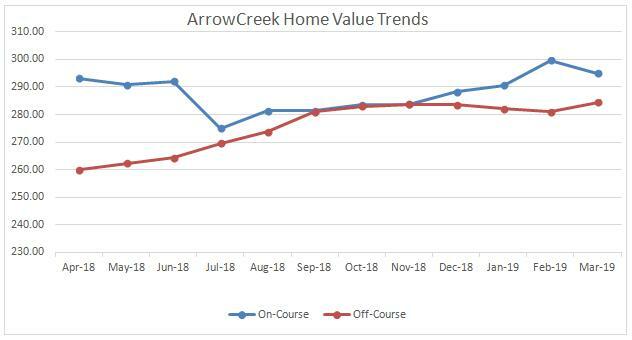 Welcome to the ArrowCreek monthly property value update for a High Desert, Semi-Rural community that happens to contain a PRIVATE Golf Course. Participation in the private golf club is purely optional for all interested parties. The financial diversity within the ArrowCreek community was put in place by the designer of the community and the county in 1997. It consists of 506 semi-custom homes, typically for middle and upper middle-income individuals, and 579 custom home sites, typically for upper middle and high net worth individuals, of which 428 custom homes have or are being built. As an observer can see, we are a very financially diverse community. This report contains the data that was available on 3 December from the Washoe County Assessor’s Records. The vagaries of the housing market have definitely caught up with the ArrowCreek community. Only two (2) properties changed owners during this reporting period. This is a significant drop from the previous months where we had ten properties changing hands. Custom homes on the Golf Course (Non-Residential area) now exhibit a -3.6% premium to custom homes not on the course. In the meantime, semi-custom homes not on the course are a -0.5% lower than those abutting the course. This, of course, leads to the question of ‘What are the value propositions for ArrowCreek properties?’ Key ‘take-aways’ of these ‘facts’ are that smaller homes are selling better than larger homes, and ArrowCreek owners have the option to join ‘The Club at ArrowCreek’ or not to join – an individual choice of freedom versus other gated communities. a.) Only two (2) properties were recorded sold in ArrowCreek between 31 October and 3 December (per the Washoe County Assessor, who appears to be current in closed sales.). This brings the total number of properties transferred over the past rolling year to 105 or 9.7% turnover rate for our community. This remains a relatively low rate, still in the single digits, that may be attributed to a general satisfaction with living in our gated community and/or a positive perspective on our amenities and an emphasis on the secure stable environment offered within ArrowCreek. b.) There weren’t any properties on the golf course (where the property boundaries actually touch the golf course, not just have a ‘view’ of it) were closed during this reporting period. The rolling average selling price for homes on the golf course now stands at $283.68 per square foot. This is an increase of $0.07 per square foot from October’s value, based upon the statistical rolling average calculation. The 12-month rolling average sales price decreased to $1,079,333.33, again based upon statistical methods. The rolling average selling price for undeveloped property on the golf course now stands at $292,136.06 per acre. c.) Two (2) properties were sold that are not connected to the golf course. The rolling average selling price for off-course homes increased to $283.78 per square foot, which is up by $0.83 per square foot. The twelve-month rolling average sales price for non-golf course homes increased to $966,171.16. One of these properties was a lot. The rolling 12-month average selling price for vacant land, not on the golf course, stands 52% below vacant golf course property at $192,573.30 per acre. 2. Summer is over and the housing market has turned soft. For those desiring a secure, safe environment to raise a family, ArrowCreek should not be overlooked. Reno market ‘in general’ – Custom homes in Reno are selling, on average, for $280.62 per square-foot (Median price $1,150,000) with an average of 173 days on the market. As noted above, you can see our ArrowCreek comparable custom homes are selling $24-35 per square-foot higher. Data for separate ArrowCreek average time on market was not available. Reno homes comparable to ArrowCreek semi-custom homes are selling for $217.12 per square-foot (Median price $567,995) with a time on market of 91 days. Again, ArrowCreek semi-custom home averages are around $39 higher per square-foot. Median prices rose across the Reno market by 8.2% during the comparable past year while ArrowCreek combined average prices were 6.2% higher. Sparks market ‘in general’ – The top quartile in the Sparks market actually compares with the semi-custom homes in ArrowCreek. The median price for these Sparks homes is $179.45 per square-foot (Median price $544,450) with an average of 95 days on the market. ArrowCreek semi-custom home averages are around $78 higher per square-foot. Median prices rose across this market by 10.1% during the comparable past year. For the ArrowCreek community, the semi-custom homes rose 7.7%. 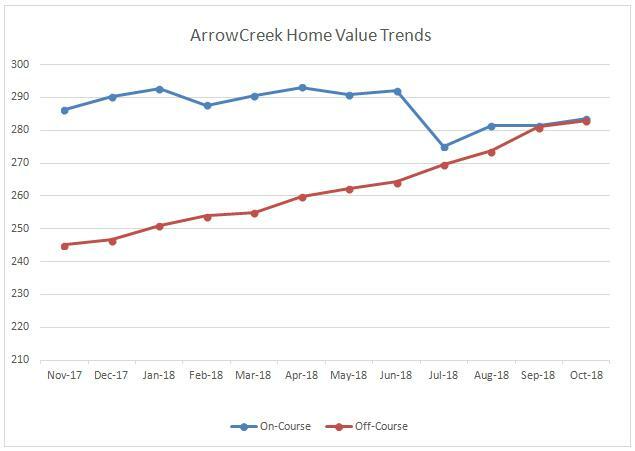 Welcome to the ArrowCreek monthly property value update for a High Desert, Semi-Rural community that happens to contain a PRIVATE Golf Course. Participation in the private golf club is purely optional for all interested parties. It has come to the author’s attention that some members of the ArrowCreek community do not comprehend the financial diversity of our community. The financial diversity within the ArrowCreek community was put in place by the designer of the community and the county. It consists of 506 semi-custom homes, typically for middle and upper middle-income individuals, and 579 custom home sites, for upper middle and high net worth individuals, of which 327 custom homes have or are being built. As an observer can see, we are a very financially diverse community. This report contains the data that was available on 1 November from the Washoe County Assessor Records. Yes, it is amazing what happens when an election rolls around – the records are being kept up to date. The vagaries of the housing market have definitely caught up with the ArrowCreek community. An additional five (5) properties changed owners during this reporting period. This is a significant drop from the previous two months where we had ten properties changing hands. Custom homes on the Golf Course (Non-Residential area) now exhibit a -4.3% premium to custom homes not on the course. In the mean time, semi-custom homes not on the course are -0.5% lower than those abutting the course. This, of course, leads to the question of ‘What are the value propositions for ArrowCreek properties?’ Key ‘take-aways’ of these ‘facts’ are that smaller homes are selling better than larger homes and that ArrowCreek owners have the option to join ‘The Club at ArrowCreek’ or not – an individual choice of freedom versus other gated communities. 1. ArrowCreek properties have stayed in the premium class within Washoe and Douglas Counties. As you read this report, you will see that prices began to trend together after a spike in property values for properties on the golf course in the Spring of 2017. 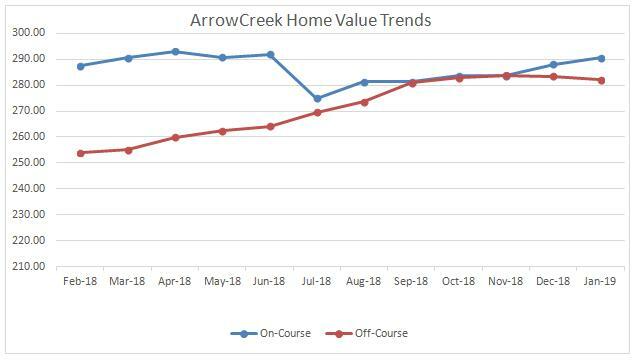 What this trend indicates is that homes in ArrowCreek appear to be settling into a growth pattern beginning in the $283 per square foot region. With only five properties in four neighborhoods changing hands this past month, the “hottest” neighborhood was Sundance. a.) Five (5) properties were recorded sold in ArrowCreek between 28 September and 22 October 2018 (per the Washoe County Assessor, who appears to be current in closed sales.). This brings the total number of properties transferred over the past rolling year to 108 or 9.9% turnover rate for our community. This remains a relatively low rate, still in the single digits, that may be attributed to a general satisfaction with living in our gated community and/or a positive perspective on our amenities and an emphasis on the secure stable environment offered within ArrowCreek. b.) One (1) property on the golf course (where the property boundaries actually touch the golf course, not just have a ‘view’ of it) was closed during this reporting period. The rolling average selling price for homes on the golf course now stands at $283.61 per square foot. This is an increase of $2.16 per square foot from September’s value, based upon the statistical rolling average calculation. The 12-month rolling average sales price decreased to $1,117,526.32, again based upon statistical methods. None of the sold properties were lots on the golf course. The rolling average selling price for undeveloped property on the golf course now stands at $292,136.06 per acre. c.) Four (4) properties were sold that are not connected to the golf course. The rolling average selling price for off course homes increased to $282.95 per square foot, which is up by $1.97 per square foot. The twelve-month rolling average sales price for non-golf course homes increased to $958,253.16. One of these properties was sold as a ‘vacant’ lot, even though a home exists on the property, during this reporting period. The rolling 12-month average selling price for vacant land, not on the golf course, stands 55% below vacant golf course property at $188,617.56 per acre. 2. Summer is over and the housing market has turned soft. For those desiring a secure, safe environment to raise a family, ArrowCreek should not be over-looked. Reno market ‘in general’ – Custom homes in Reno are selling, on average, for $274.59 per square-foot (Median price $1,100,000) with an average of 150 days on the market. As noted above, you can see our ArrowCreek comparable custom homes are selling $28- 41 per square-foot higher. Data for separate ArrowCreek average time on market was not available. Reno homes comparable to ArrowCreek semi-custom homes are selling for $217.12 per square-foot (Median price $567,997) with a time on market of 75 days. Again, ArrowCreek semi-custom home averages are around $39 – 40 higher per square-foot. Median prices rose across the Reno market by 6.5% during the comparable past year while ArrowCreek combined average prices were 9.2% higher. Sparks market ‘in general’ – The top quartile in the Sparks market actually compares with the semi-custom homes in ArrowCreek. The median price for these Sparks homes is $184.00 per square-foot (Median price $559,500) with an average of 78 days on the market. ArrowCreek semi-custom home averages are around $72 – 74 higher per square-foot. Median prices rose across this market by 10% during the comparable past year. For the ArrowCreek community, the semi-custom homes rose 9.8%. Please join the ArrowCreek HOA Board Budget Committee for the ACHOA Owner Town Hall to talk about the Draft 2019 Budget with potential $8/month increase. The increase is to cover inflationary costs of about 3%; particularly, increases in staff salaries to be competitive with the tight labor market conditions, higher utilities and costs of materials. Click here to view/print the Draft Budget Committee Presentation for the Town Hall. The Budget Committee would like to hear from you before providing a final budget to the Board for approval. We hope you can attend. You can also email comments to ACservice@associasn.com. Thank you!